Gov. 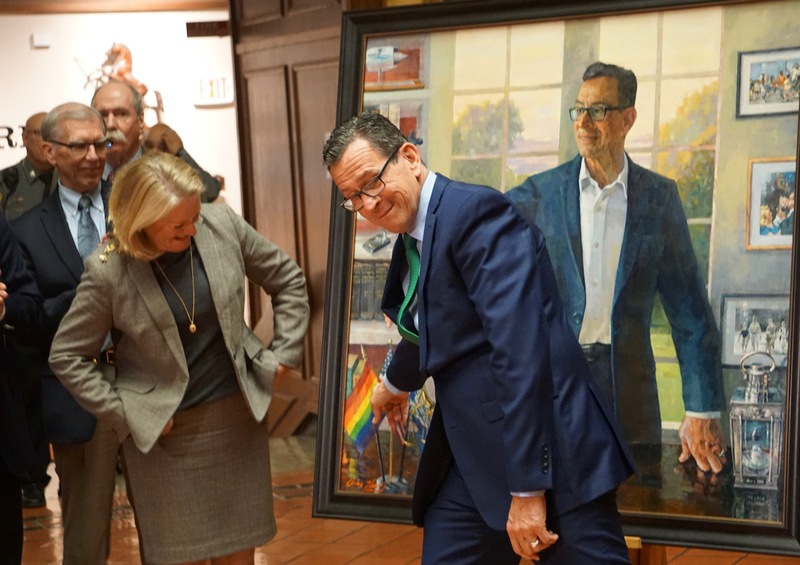 Dannel P Malloy points to the gay-rights flag in His portrait. At left is First Lady Cathy Malloy. He is not leaving office for another 20 days, but the official portrait of Gov. Dannel P. Malloy already is in the Museum of Connecticut History, unveiled Thursday night before the governor’s family and a broad cross-section of people who served him in politics, government, or both. The portrait by Christopher Zhang, an artist who was born and educated in China and now lives in East Lyme, shows Malloy standing at his desk at the Executive Residence, reaching forward. On the desk and walls are items of personal and political symbolism, including the rainbow flag of the gay-rights movement. The portrait of his predecessor, Gov. M. Jodi Rell, wasn’t unveiled until September 2013, nearly three years after Malloy’s election to the first of his two terms. It hangs at the far end of the portrait gallery, a space beneath it awaiting Malloy. The gallery occupies the center of the building housing the State Library and Supreme Court. Zhang said he began work after visiting Malloy at the Executive Residence, examining the governor’s photos of his wife, Cathy, their three sons, two daughters-in-law and one granddaughter, Grace. He said the governor was patient in sittings, an assertion that prompted eye rolls from his staff. His three chief of staffs — Timothy Bannon, Mark Ojakian and Brian Durand — each spoke, recounting events on their watch. Ojakian, who is gay, mentioned Malloy’s support of gay marriage and how the governor twice raised the rainbow flag over the residence to support advances in gay rights. Ojakian also recalled the day he had to inform Malloy there had a been a shooting at Sandy Hook School in Newtown. In the painting, Malloy is wearing a Sandy Hook Promise wristband, a nod to the massacre six years ago, not quite halfway through his first term. Models of a Pratt & Whitney engine, Sikorsky CH-53K helicopter and a submarine are visible on shelves, signifying the governor’s efforts to stabilize the defense industry in Connecticut. That state was Indiana. Its governor at the time was Mike Pence, now the vice president. The portrait costs about $30,000 and was paid for by the state. Cathy Malloy was emotional as she introduced her husband and talked about the next chapter in their marriage, when his term ends on Jan. 9.